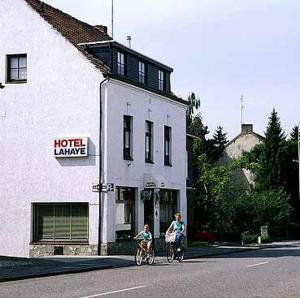 Lahaye is a family-run- , located just outside the centre of Valkenburg, on the borders of naturepark Ingendael. Our is suitable for the individual traveler, as well for groups up to 60 persons. We provide excellent service in combination with friendly prices. The has its own restaurant and cafe, plus a big and safe parkingplace (suitable for coaches). Lahaye is closed from 10 October 2003 until 15 March 2004. You are insured of the lowest internet-rates. But you can pay at the reception of Hotel Lahaye, Valkenburg a.d.. Without reservation costs and at the lowest price! After your reservation you receive a conformation by e-mail. We wish you a pleasant stay at our hotel in Valkenburg a.d..
All hotels within Valkenburg a.d.: Click here.